With Christmas looming (at the time of writing) I have taken it upon myself to destroy some baubles. At first I was deceived by some high quality plastic ones that I mistook for glass. Since then I have been able to acquire hollow glass spheres of two sizes and solid glass spheres of two sizes. The solid glass spheres cost about the same as tektites - a shame to destroy them really. So, hollow spheres first. 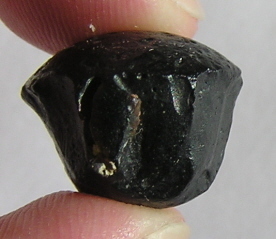 The size I opted to use was around 75mm diameter and comparable to a tektite of around 500g (if it were solid). Next, I used the same size hollow sphere, but this time only heated it briefly and gently. Again, it did not crack until I quenched it in room temperature water. The result was a lot more similar to what we see in Philippinites, with the production of a polygon. Next I attacked a solid sphere, by heating it in exactly the same manner. 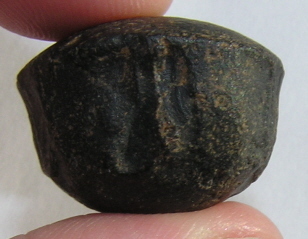 The solid sphere was 55mm in diameter and weighed in at 300g. The results were quite different to the hollow sphere. As you recall, the hollow sphere did not crack easily on heating, only when it was rapidly quenched in water. The solid, sphere, however, cracked, then rapidly flaked in an explosive manner. See the snap-shots below. The flakes came off individually or more commonly a few at once - and always catastrophically / explosively. ABOVE: A few australite cores - remarkably similar to my glass core! One has to bear in mind that the glass I used is different to tektite glass and during manufacture it is cooled in a more controlled manner. The temperatures used are different and the tektite was not travelling at hypervelocities when I did the experiment. Despite the many differences, I think we can glean a little about the properties of glass and how it cracks and breaks as a result of thermal stresses. The solid sphere cracked in a remarkably similar way to australite cores - perhaps suggesting australites were fully solidified on re-entry. Hollow spheres behaved very differently. When I think of Philippinites I am guessing the hollow sphere scenario is more applicable. I am not saying that Philippinites were hollow, but that a brittle solidified outer shell enclosing a slighlty plastic, more molten, interior. This results in a cross between the hollow and solid sphere scenarios to explain the cracks seen in Philippinites. Considering this, it certainly makes sense. Philippinites would have travelled to the Philippines in roughly one third of the time it took for australites to reach Australia. At 10 km/sec it only takes three and a half minutes to travel the 2,000 kilometres to the Philippines. On top of that, the lack of air molecules in sub-space results in an insulating effect on the tektite. It is highly feasible that Philippinites, whilst relatively solid, where not totally solidified on the interior at the time of re-entry. This results in cracking and some shell loss, but not in the same manner as in australites. Please remember - if you choose to repeat these experiments at home, and I suggest you don't, then you need very good eye protection (fully enclosed googles, as glass can get behind eye glasses) and shielding for the rest of your body - glass explodes. Exploding glass can blind you and cut you. The girlfriend or wife whose kitchen has been destroyed, can do similar. These experiments are dangerous! In tektites the loss of material through thermal stresses is known as spallation. 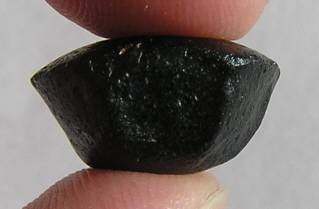 During re-entry the tektite is rapidly heated and then rapidly cooled. It appears that the cooling stage, once the inherited cosmic velocity was lost, is when material is lost. Spallation may occur near the Troposphere - Stratosphere boundary (20 km altitude in the tropics, 17 km altitude in the mid latitudes). Here the temperature of the atmosphere drops off to around -60 deg C (-76 deg F). At this stage the inherited cosmic velocity will have been lost and the free falling tektite will be suffering wind-chill in stark contrast to the earlier re-entry heating!